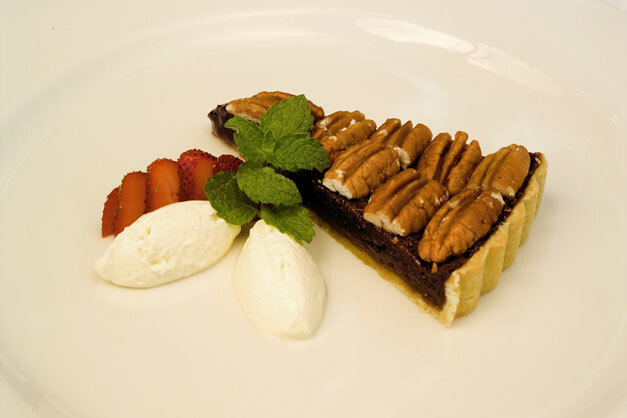 It’s Camp Jabulani’s world renowned Chocolate Pecan Nut Pie. And we’re giving you the recipe almost for free. You have to do something to earn it, but it will be fun (which is why we said ‘almost for free’). We – being the folk in Camp Jabulani’s awesome kitchen – challenge you to amaze and impress your family and friends. By coming up with an inspired, fun and original way to wow the soccer fans in your house. The World Cup is on right now (just in case you’ve been living in Outer Mongolia, or under a rock! ), so we thought it would be fun to throw a party in honour of whichever team you happen to support. That’s Bafana Bafana right? Just checking! ;-). Seriously though, wherever you are and whoever you support, just put together an array of mouthwatering snacks to nibble on while watching the game. But remember to save room for dessert! Here’s the recipe, which (on a scale of one to ten) is not that difficult to make either. We’d love to hear your stories – successful, funny, whatever. And if you’re so inclined, send us some photos too. We’ll post the most original ones here on the blog. In a saucepan, over a very low heat, combine butter and chocolate. Warm gently. Using a heat-resistant rubber spatula or wooden spoon, stir frequently and watch closely to remove from heat as soon as chocolate melts. Chocolate will become grainy if overheated. Alternatively melt chocolate and butter in microwave oven. Allow to cool slightly. Bake until set. About 60 minutes. Cover edge of pie crust with a strip of foil during last 15 – 20 minutes of baking if it’s browning too quickly. Remove from oven and allow to cool on a wire rack. Top each pie slice with pecan halves. * Here is the pastry recipe if you’re Martha Stewart. If not, buy a ready-made crust. Sift the flour with a pinch of salt. Place in a food processor. Add the sugar and softened butter and blend on a high speed until bread crumb consistency. Add the ice water and blend until a dough ball forms (be careful not to over-mix the dough).